With the long-awaited release of the 3rd Edition of the EF! 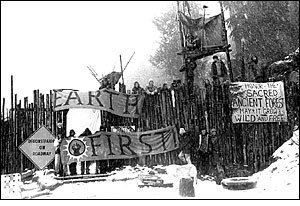 Direct Action Manual (affectionately known as the “DAM”), Earth First! organizers are hitting the road to share direct action skills and get the manual into people’s hands. We are currently looking to book mini-tours on university campuses around the US (and possibly abroad) throughout the year to spread inspiration and skills, as well as help with movement fundraising. Cascadia Free State on Warner Creek in ’96. Wanna learn how to pull off actions like this? Well, then set up a DAM event in your town! All money raised will be split between the Earth First! Journal—the longest running radical environmental paper in the world–and revitalizing the EF! Direct Action Fund—a pool of money that is donated to groups on the front lines of eco-resistance.The book tour stops will consist of a presentation and slideshow about Earth First! and the ecological resistance on the rise around the world. For our more ambitious hosts, we would love to arrange trainings aimed at teaching some of the direct action skills discussed in the DAM to local organizers. We will also be offering a plethora of EF! propaganda and merchandise for an anti-consumerist shopping spree, courtesy of the EF! Journal. There will be 3-5 people on tour who need a place to sleep/eat the night, or nights, in each town. Trainings that require gear will need advance notice. Advance copies of the book will be available after March 1st for folks setting up stops to be able to select possible trainings and help build excitement for events. Check here for tips on organizing a local event in your community.